We’d love your help. Let us know what’s wrong with this preview of Senseless Confidential by Martin Bannon. Hardly a day goes by when some fuckhead doesn't want to shoot me. Today is no exception. Meet Nick Prince, who just wants to go drown his sorrows at the Safari Club and pine for Beth, his lost college love. But before he can do that, his job with the U.S. Census Bureau requires him to face down reluctant respondents in the remote forests of Oregon, who repel him with everyt Hardly a day goes by when some fuckhead doesn't want to shoot me. Today is no exception. To ask other readers questions about Senseless Confidential, please sign up. Senseless is a laugh-out-loud comedy, with a generous sprinkling of mystery and suspense. But it's also a sort of adult coming-of-age story, filled with insightful tidbits as Nick finds his way in life. This combination works perfectly to create a truly unique plot and a captivating read. I am a sucker for compelling characters and Senseless is filled with them. No one here is perfect or predictable. I was hooked from the opening sentence. I picked up SENSELESS CONFIDENTIAL at an art festival in Wilsonville a couple of weeks ago, not only because I like settings with which I am familiar (Oregon Cascades) but because The Census has been in the news lately. I totally enjoyed this book. Bannon's dark humor reminded me of Carl Hiaasen. He juggles several subplots, with as many twists and turns as the logging roads in the book, but everything is beautifully sewn together by the delightful ending. Catch-22 often came to mind when reading I picked up SENSELESS CONFIDENTIAL at an art festival in Wilsonville a couple of weeks ago, not only because I like settings with which I am familiar (Oregon Cascades) but because The Census has been in the news lately. Catch-22 often came to mind when reading SENSELESS. If it is possible for a 30 year old man to have a coming of age story, this would be it. "That's your problem, Nick. You're a dreamer who never wakes up to do anything about it." Nick Prince works for the U.S Census Bureau, living his life from day to day on nothing more than hopeless dreams of his long-lost college girlfriend Beth. He doesn't envolve himself in anything other than drinking beer, watching strippers and perfoming a job, he took and kept out of necessity and in the believe he could do nothing else. When a Census visit evolves in unexpected ways, Nick finds himself in th "That's your problem, Nick. You're a dreamer who never wakes up to do anything about it." When a Census visit evolves in unexpected ways, Nick finds himself in the threat of imprisonment on several accounts, and the story takes many impossible-to-forsee turns and twists. The unpredictable ups and downs of life, that Nick has been able to escape by not living his own life catches up with him, and he is finally forced to choose which path to take. I would never have picked this book in a bookstore, and I'm sorry to say so, by I judged this book by its cover - and the cover is sort of awful. I won this book in a give-away here on Goodreads, and I'm grateful I did! This book truly surprised me time and time again, even though some elements were quite predictable. I loved the story, but also what it overall told me; that life is unpredictable, and you can't hide from it forever. So much healing laughter and entertainment in the same story, loved it! I don't want to get into any details that would be spoilers, but Martin Bannon truly writes his way across the entire human spectrum with this riveting and hilarious book. Consider this to be a summer reading must. What a fun book to read!It truly is a laugh outloud mystery/suspense novel. If you like carl hiaasen you'll love Oregon's own Martin Bannon. I don't want to do any spoilers on the book so just go buy it and you'll see. This was a fun book! I know the author, so of course, wanted to read his book. It is very good - keeps you going! Without the local connection, I'm not certain I would have picked this book up. It is a fun read, and delivers what it promises. But it doesn't quite rise above the average. The scenario itself was worthy of a Tom Robbins absurdist tale, but it just never got there. Too bad because I could always use another Tom Robbins. I wasn't sure what to expect from this book when I picked it up, but I'm glad I gave it a chance! I couldn't stand to put it down and ended up taking two days away from real life so that I could finish it. I'm looking forward to read more of Bannon's work - highly addictive. Originally from the San Francisco Bay Area, Martin Bannon has lived in Oregon's politically schizophrenic Clackamas County since 1998. 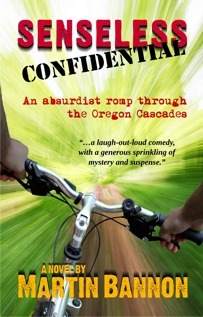 Senseless Confidential, a comedic crime caper through the county's backwoods, is his third book. Bannon, who has lived in places as varied as Puerto Rico, Switzerland, and Utah, majored in Soviet Studies to pursue a career in Intelligence. When he discovered that the Originally from the San Francisco Bay Area, Martin Bannon has lived in Oregon's politically schizophrenic Clackamas County since 1998. Bannon, who has lived in places as varied as Puerto Rico, Switzerland, and Utah, majored in Soviet Studies to pursue a career in Intelligence. When he discovered that there was no such thing, he became a writer instead, where he has been living out cover legends ever since. He is fluent in three languages and can make educated errors in several more. He has traveled to 38 of the US states and 19 foreign countries. He has been a tea guest of Her Majesty Queen Elizabeth II, pursued by Hungarian security forces, and questioned by East German authorities.